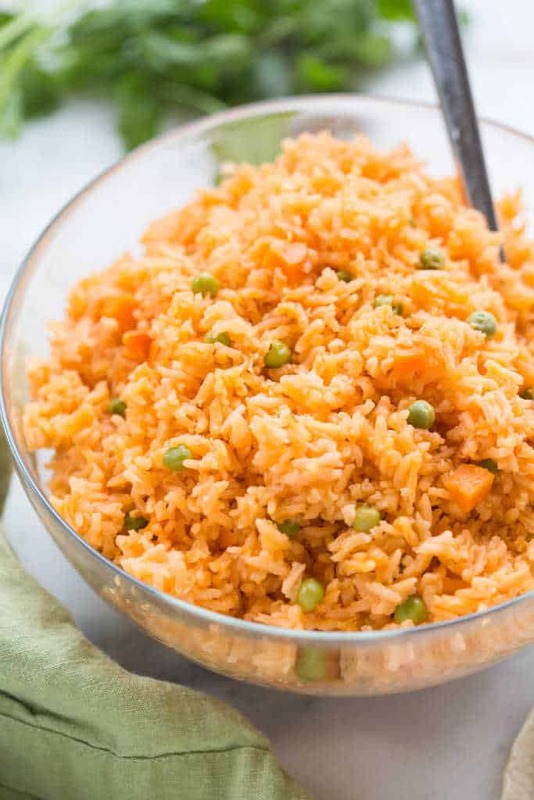 The BEST, truly authentic Mexican rice is an easy recipe to make for a crowd and it’s a necessary side dish for all of your favorite Mexican recipes. 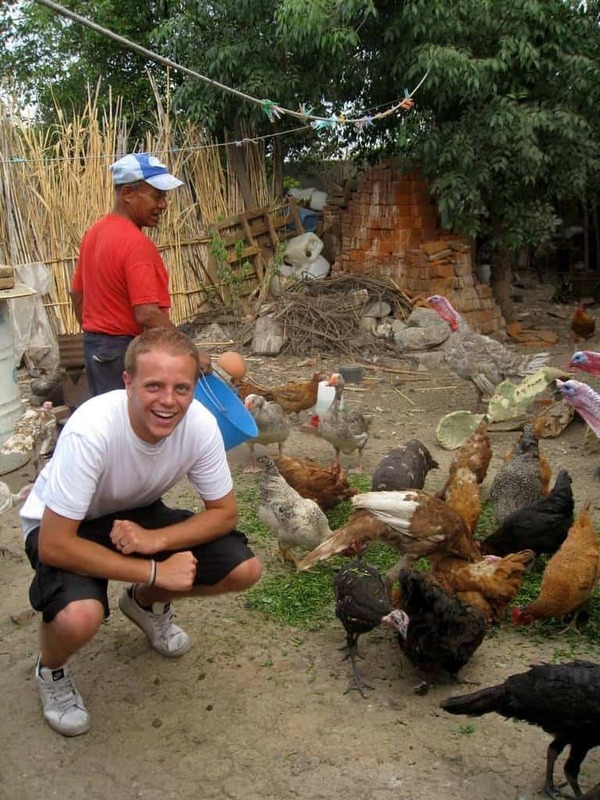 During college my husband and I spent a semester in Puebla, Mexico for an Internship. We taught workshops to locals in the area that were interested in starting a small business. I have the best memories of our time there. It was during our second year of marriage, we had no kids, and we spent every single day in Mexico together! It was hard work, but also amazing to spend so much quality time together. We lived in the cutest little house in downtown Puebla. We didn’t have a car, so we walked everywhere–probably a good thing because it allowed me to eat my heart out without gaining any weight. We also made some really great friends that we still keep in contact with. One of the people that attended one of our workshops was a Chef at a well known restaurant there. We became friends and ended up asking him if he would teach us how to make authentic Mexican recipes. He invited us to his home and we spent the day there making food and getting to know his awesome family. I dug up some photos from that day to share with you all. This is such a special memory for me. (Our friend is in the photos below, in the green shirt. You’ll notice me at his kitchen counter taking detailed notes, like the food nerd that I am 😉 ). Some things we made together include mole poblano, red and green salsas, and pozole. 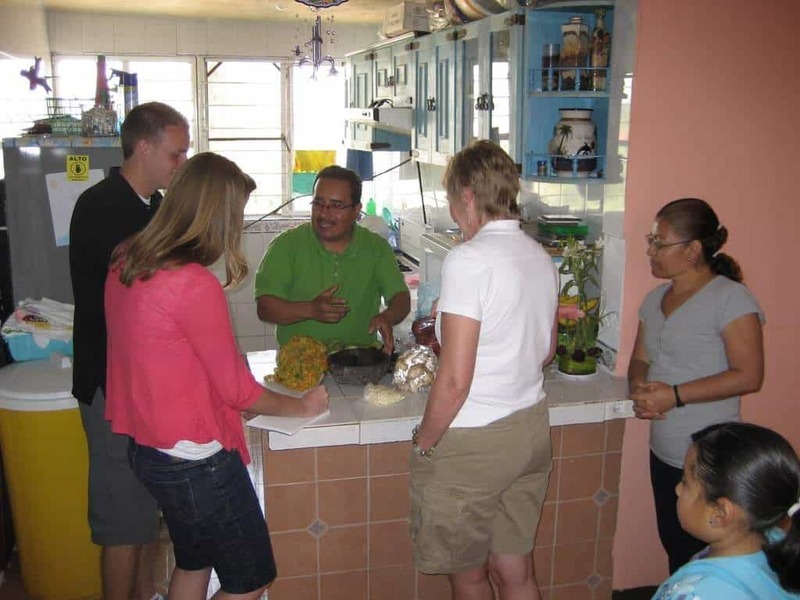 He also taught us how to make this authentic Mexican rice! This Mexican rice recipe is the real deal, and every time I make it it transports me back to the time we spent there. It has become a staple at our house any time we are making any type of Mexican food. In case you missed it, here’s a round-up of many of my favorite Mexican recipes! Add oil to a saucepan over medium heat. Add the rice and stir to combine. Cook the rice until lightly golden brown all over. Add tomato sauce, garlic, and diced onion to the pan. Cook until bullion cubes are dissolved. Bring it to a boil, cover, and simmer for 20 minutes. 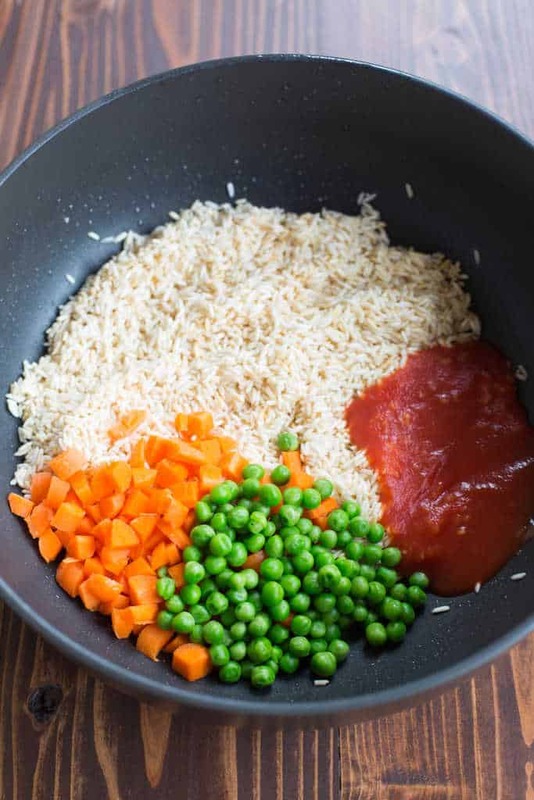 Take an extra second to rinse your rice with water to remove the starch film on the surface that can cause the rice to clump together. Tomato bullion cubes add great flavor, and they’re what makes the rice turn that perfect orange color that you’re looking for. It should be easy to find at your local grocery store. I buy mine at Walmart, in the Mexican food aisle. You could also buy them from Amazon. They look like this. Our friend added serrano peppers to the pot while the rice cooked. This is optional. It adds a little bit of flavor, but I make it all the time without the peppers. And don’t worry, the peppers wont make the rice spicy. Again, these are completely optional. 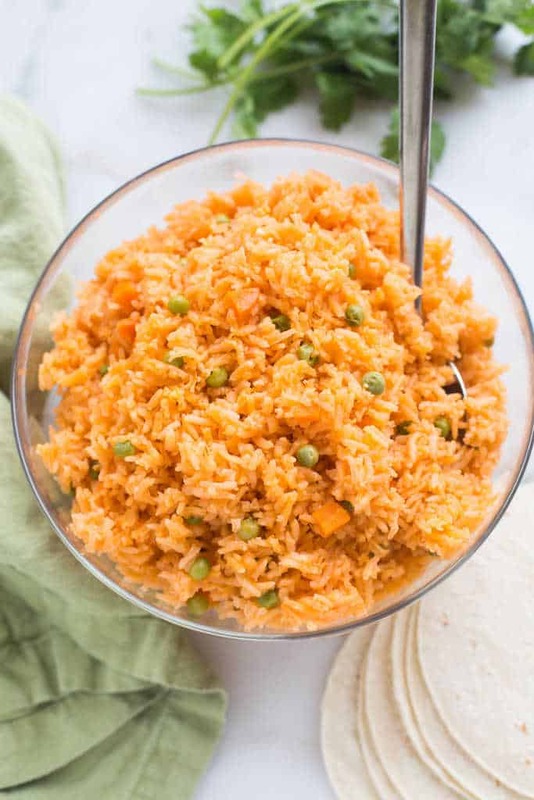 Try making Mexican rice in the Instant Pot! If you own an instant pot, you can make instant pot Mexican rice with this recipe! 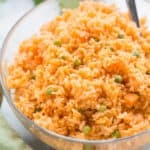 The BEST, truly authentic Mexican rice is an easy recipe to make for a crowd and it's a necessary side dish for all of your favorite Mexican recipes. Tips for perfect rice are listed above in the post! I originally shared this recipe in September 2011. I recently updated the photos and recipe to be more clear. When using granulated tomato chicken bullion; how much to match the two cubes? Also are the serrano peppers kept whole or diced up? Thanks! I don’t feed my family MSG it super bad for you, is there a substitute for this? Do you think there would be a huge difference if I used Natural Brown Rice? That would be fine! Add 1/4 cup extra water and cook for 45 minutes. Allow to rest for 15 minutes before opening the lid. Can you double this recipe? I have to bring Mexican rice for a dinner party for 12. This recipe is AMAZING!! I make it exact to the recipe and add in the Serrano peppers and it is just delicious! I’m so glad to have found this! I’m so glad you liked it! This is truly one of our families treasured recipes!